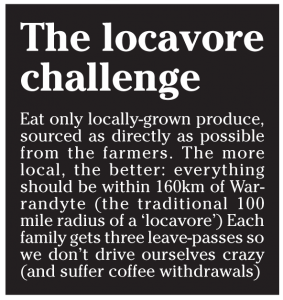 Eating local: is it possible? The article below originally appeared in the June 2015 edition of Warrandyte Diary. Click here to view/download the original article in pdf format. ‘Food is Free’ initiative at The Rotary Club of Warrandyte Donvale Op Shop. J.B. Shackleton’s – World champion marmalade maker from Wonga Park. Allegations aired by the ABCs Four Corners program last month of virtual slave labour on Australian farms have prompted four local families to see if it is possible to eat locally, ethically and as direct from the farmers as possible. All expected to eat better, fresher produce – but it was the connection the families felt that took everyone by surprise, as LARA McKINLEY reports. It was day three into our week-long challenge to eat locally. It was a mad, crazy thing to do and I’d been researching my little socks off just to get food on the table. My family were having dinner. It was all smiles – with a family of five that’s the first miracle – then it got better: My son Billy said, “Tell us the story of the food.” And just like that we had shifted from anonymous supermarket shopping to something more connected and authentic; our second little miracle. We had caught the fish from the Buxton Trout Farm that afternoon. There was a roast veggie salad from Stu and Luna’s farm up at Gladysdale, topped with Anna’s to-die-for fresh feta from Coldstream Dairy. The greens were from Fiona’s veggie patch down the road (traded for lemons) and our big tray of roast potatoes came from Joe’s place up in Gembrook (say hi next time you see him at Eltham Farmers’ Market or Warrandyte Community Market). It was all dressed with David’s Arthur’s Creek olive oil and rosemary from our garden. This list seems alarmingly long even as I write it and uncharacteristically posh – but really the effort was no more than a trip to the local Farmers’ Market and a lovely family day out. And the food – because it was bang on season – wasn’t much more expensive than the standard super-market fare. The bonus was we were supporting local producers – people we’d met and chatted to – and it felt really good. It tasted even better. 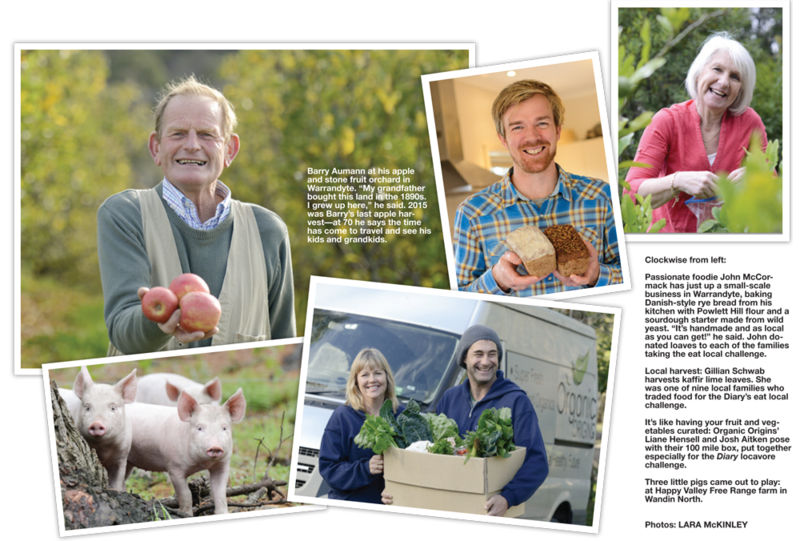 It was that sense of connection that Sophie Whitwell, her family Ada, Betsy and husband Nick were hungry for when they volunteered for the Diary eat local challenge. As a busy working mum, Sophie said she felt uneasy she had opted for the convenience of supermarket shop-ping and easy-to-prepare meals; that she had lost the joy in food. “A part of me was really upset by that; that life didn’t allow [time] to prepare soulful, soul food. Sophie said the beginning of the week was a whirl-wind of preparations and research. “You couldn’t just go into a shop and buy whatever. You really had to ask where your food was coming from. It made me stop and think.” Her first point-of-call was Liane Hensell at Organic Origins. 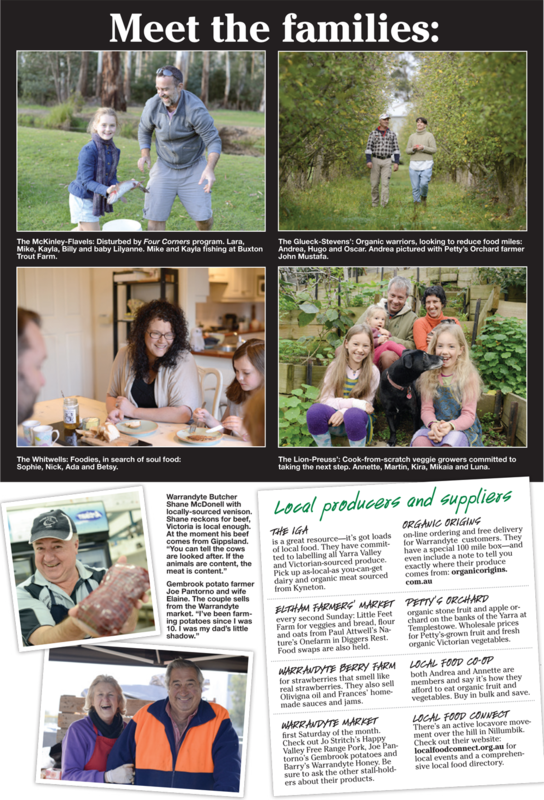 They are based out of South Warrandyte and have an on-line home delivery service for fresh produce. Delivery to Warrandyte is free. Annette Lion and her family were already well set-up for the challenge. They had a flourishing veggie patch and were committed to cooking most of their food from scratch. She said she spent a long time studying labels, trying to drill down to find the origin of their food. “I do struggle with the idea: is local, conventional produce better than buying organic?” Annette told the Diary. “What’s the priority – getting down food miles or reducing chemical use? It’s a huge, huge topic. “This isn’t a one-off week for me. It’s going to be a continuous change.” As a vegetarian, Annette found it challenging to find locally-grown grain and pulses – the nearest source was Mount Zero, near the Grampians. 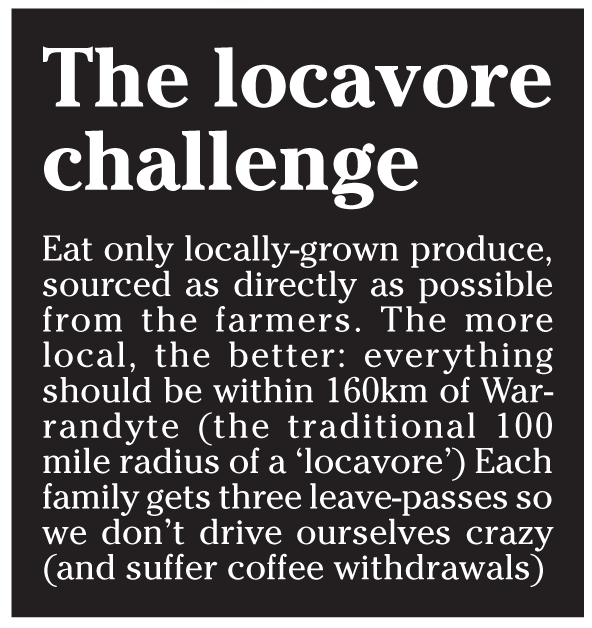 It’s sold at the Aumann’s Family Orchard shop in Warrandyte, but grown more than 300kms away. Supplementing her veggie patch proved easier, with an order direct from Stu and Luna at Little Feet Farm in Gladysdale, south-east of Launching Place. I’d met Stu the previous week at the Eltham Farmers’ Market and he’d invited me to check out their farm. The couple are part of a new-generation of farmers: first-time growers passionate about developing sustainable permaculture-inspired small-scale agriculture. Their property is about 45 minutes from Warrandyte surrounded by mountain ash and peppermint trees. It’s a tiny plot by modern standards —just 3/4 of an acre is under cultivation. When I arrived, Luna was planting garlic. “It’s amazing how much you can grow. With this land, we figure we can feed 50 families for six to seven months of the year. We are aiming for nine months next year,” she said. Stu presents me with two boxes – one for my family and one for Annette—brimming with produce: pumpkins, leeks, onions, fennel and all kinds of greens. “You really do get what you pay for. People need to think about why things are so cheap. It’s a false economy,” he said. As I cooked with the food for the rest of the week, I thought: “This is the best forty bucks I’ve spent in a long while.” I couldn’t waste a thing. I even made stock from the trimmings. The final member of our eat local crew is Andrea Glueck – a newly-single mum with two boys Hugo and Oscar. Andrea is run-off-her-feet busy, but is deeply committed to her family’s well-being and providing simple, organic food. She said eating and shopping locally reminds her of home and reinforces her sense of community. “I grew up in Germany. We’d get our basket and go to the butcher, the baker. I love going to the little shops and producers. I find it really important, that whole chit-chat thing – where you are treated as a person, not as a customer. We spoke with John Mustafa, a third-generation apple farmer who leases his 110 acres from Parks Victoria. He knows his apples are good: he sells directly to the most exclusive of Melbourne restaurants, wholesale across the country, as well as direct from his farm-gate. Andrea’s eldest son Hugo is with us and listened carefully to John. “I think by eating local you can make the farmers stronger in what they produce. Everyone should eat local, so you know where your food comes from,” he said. It’s a notion Julie Quinton, from Quinton’s IGA in Warrandyte fully supports. She said she is proud of the number of local suppliers they stock in her shop. “We want to hang onto that. I’d rather go local. “Every day we drive up to Wandin to pick up strawberries. The strawberry guy (Pasquale) is a bit of a professor. People come here for the strawberries, they are just that good,” she said. We walk through the shop and cool room on the lookout for local produce. Apart from strawberries, tomatoes and garlic, we find several locally-grown veggies as well as milk, cheese, butter and organic beef from within the prescribed 160km. If I was buying locally produced pre-packaged food I’d be set – the Yarra Valley is very close by and IGA has a wide selection. Julie said she still struggles with food labelling – Australian-made is not always as clear cut as she would like, and the sheer volume of products (almost 30,000) makes it impossible for her to know all the producers in her supply chain. The demand for a variety of fruit and vegetables means it’s not practical to stock only locally-grown produce. “I am a firm believer that the food you put on your family’s table should have no chemicals, be good quality and be Australian. Otherwise by the time my grand-children grow up, they won’t have a choice. “If consumers want to change, they need to get behind our farmers. Maybe we can all make a change for a better world,” she said. At the end of the week our families got together for a big locavore feast. We kick off with pork ribs from Jo Stritch’s Happy Valley Free Range farm in Wandin and Coldstream beer. Sophie brings a share plate of veggies we traded earlier in the week from other Warrandyte families. Andrea’s beetroot dip and warm bread is divine. Roasted local veggies and Buxton trout fill out the meal. The conversation is lively as we all reflect on the challenge. Some parts were tricky – after searching we found grain and flour right on the edge of our 160km radius. The fresh produce was easy. We are, after all, right on the edge of Melbourne’s food bowl. All our kids got behind the challenge. The food was great. We felt healthier (so many greens to get through!) and we loved sharing our discoveries with each other. Sophie said: “For me, it’s put colour back into the local community. I nearly cried when I saw how many people in Warrandyte were offering up food from their gardens and tables, people we didn’t even know.